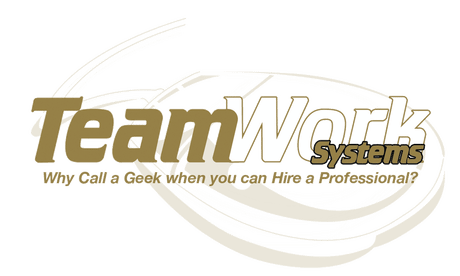 Team Work Systems – Why call a Geek when you can Hire a Professional? Please call us the next time you need any computer related work done in your office or home. We typically reply with in 24 hours, but if you can’t wait, drop us a line on 239-348-1500 – Thank you! We can set up your new computer and any additional peripherals you purchased, then show you how to use them. We get it done right the first time. We can assist you in moving information from your old computer to your new one.Is your computer slowing down or running out of space? Call us next time you need to upgrade. Our trained and experienced technicians come to your home or office and most of the time, we can resolve any problems you have right on site. We do not charge A-La-Carte per device or service. We are used to working under pressure and can multi-task. No need to transport or mail heavy equipment to a drop off location or factory. When we leave, the required task is done right the first time and complete! Not only do we understand technology, we know how to ask the right questions. It takes understanding each client’s individual needs. Sometimes, that means thinking “out of the box” or switching gears to go in a different direction. Most of all, as a small local business, we pride ourselves on Customer Service. By doing so, we have been able to grow and service more clients year after year. We always put our customers first in everything we do. Your satisfaction is our number one priority!